Ask ABOUT OUR NEW HOME DISCOUNTS! From wooden Venetian through to conservatory, our range of blinds offers affordable and effective options for sprucing up your home. Choose from a wide range of styles or select a truly traditional design, whatever your decision, our skilled team are on hand to provide a first-class service. Control the natural light in your home with a stunning set of window shutters from our collection. If shutters aren’t your thing, we also produce a spectacular array of tailor-made curtains and fittings, just the thing if you’re after a unique design. Enhance your garden with a beautiful and bespoke garden awning. Available in a range of styles and colours, you can select a classic design or opt for a more contemporary solution. Transform your home by choosing from our wonderful range of boutique wallpapers. With an enormous collection of exclusive designs, you’ll find the ideal wallpaper to complement your home. 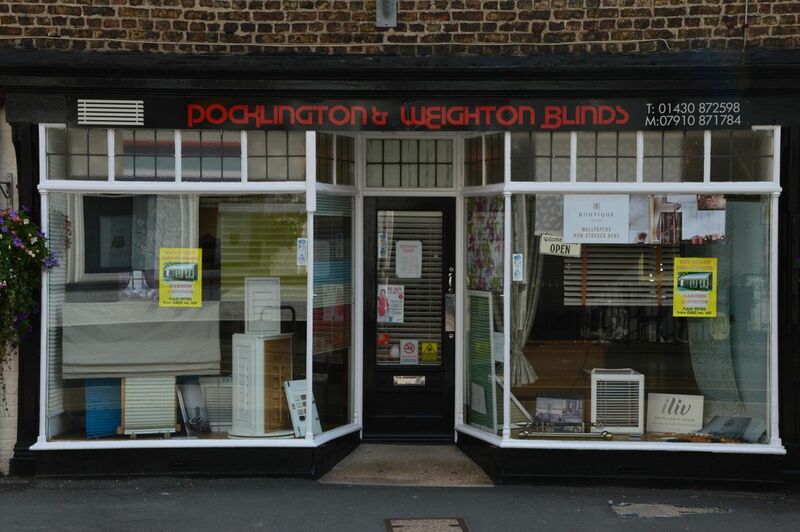 For further information on our blinds installations, GET IN TOUCH with our team in Market Weighton, east Yorkshire. Here at Pocklington & Weighton Blinds, based in Market Weighton, Yorkshire, we are an experienced, local, family-run business that has a real eye for detail. Offering quality blinds and other items, we’ll provide our professional assistance from the selection stage right through to the final installation. We’ll help you choose from our extensive range of fabrics, for blinds and curtains, all in the comfort of your own home. What’s more, our blinds are sourced from the very best suppliers, at the most competitive prices possible, so that we can supply you with only the highest quality products. With our bespoke supply and blinds fitting service, you are able to improve and enhance your home or office with ease.